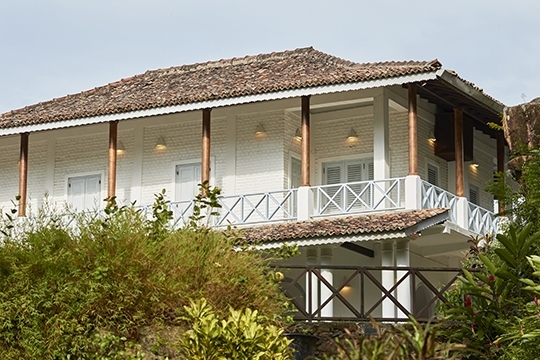 From the vantage point of a lofty hillock just inland from Koggala Lake, soak up the serenity of this wonderful location enlivened by birdsong and cooled by gentle breezes. 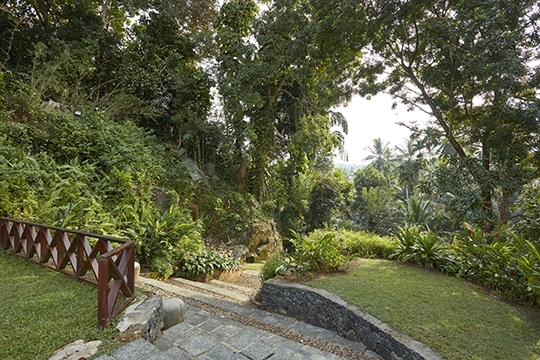 The villa’s garden extends to more than two acres and features moss-encrusted boulders, fern-covered rocks and a lush flat lawn bordering a shady wrap-around veranda. Monkeys swinging through the trees, squirrels scampering across the grass and the slothful crawl of the resident monitor lizard provide entertainment for kids and adults alike. Tucked to the side of the villa and built into the rocky hillside is an inviting turquoise swimming pool taking full advantage of the hot Sri Lankan sun. 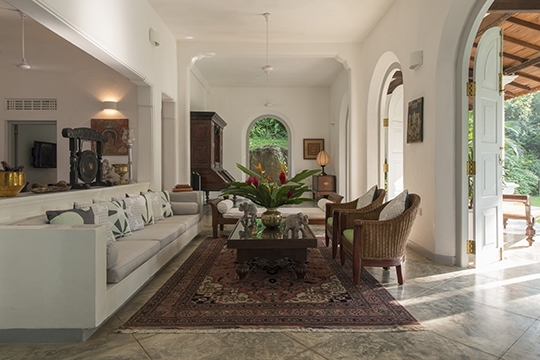 Antique furniture infuses the villa with character whilst its design reflects the Dutch in Ceylon; tall arched doorways, pillared columns, wide wraparound verandas and high ceilings feature throughout. 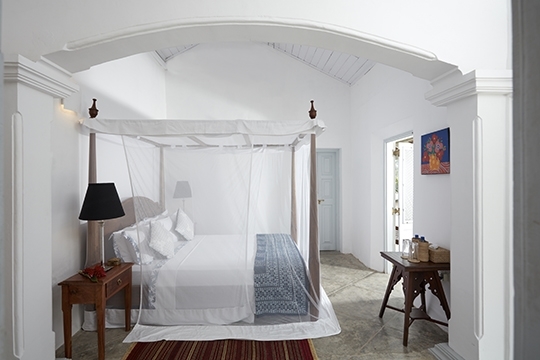 The villa has five double bedrooms; two on the ground floor and three on the first floor that lead off from a wraparound balcony enhanced by hidden nooks for curling up and reading. Also on the ground floor is a large open-plan living and dining area that spills onto the front veranda, and a small air-conditioned TV room with wide-screen TV and DVD player (there’s also an iPod dock in the living room). 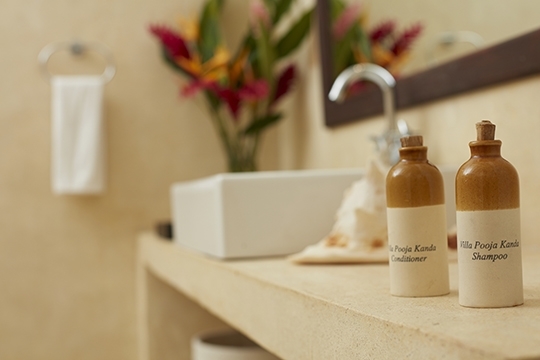 Villa Pooja Kanda is fully serviced by a small staff team that ensures the cleanliness of the villa. The chef prepares your daily breakfast and any other meals on request (provisions are charged to guest account). 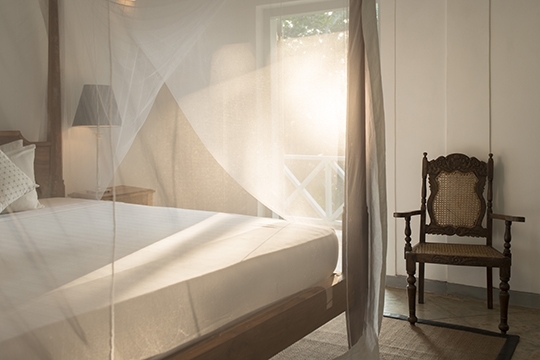 Villa Pooja Kanda’s hilltop location is completely private and feels worlds away from anywhere, yet you only have to travel ten minutes to reach Sri Lanka’s south coast beaches, restaurants, supermarkets, banks and a turtle hatchery. The nearby coastal village of Habaraduwa is famed for its bustling Wednesday market. From the balcony you can spot birds and passing troops of monkeys. Watching for wildlife on the first floor balcony; at this height you can easily spot birds and photograph passing troops of monkeys who nervously munch away at the fruit in the trees. 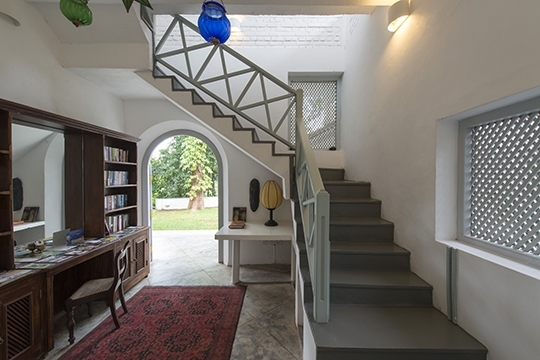 The large woodland garden and being able to choose from a selection of serene spots to sit with a book in privacy and read are other highlights at Pooja Kanda. There are drop-offs in and around the garden and beside the pool, so young children should be supervised at all times. Wildlife such as monitor lizards, geckoes, snakes and squirrels reside in and around the garden and may make an appearance from time to time – nearly all are harmless and fun to observe. We were a group of 10 who had come to Sri Lanka for my Bachelors Party. For the first time ever, I have booked a place online and found the place to be far better than the pictures posted on the Internet. Right from the time we entered Pooja Kanda we felt at home with the warm and courteous staff. The location just perfect, lush & regal. 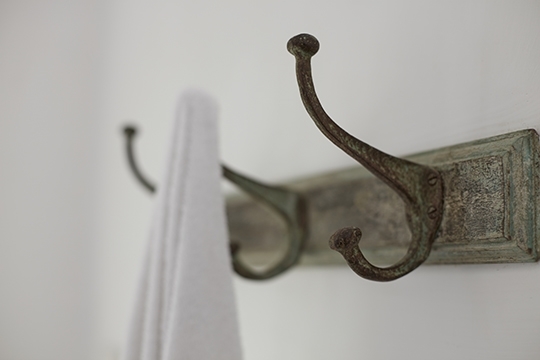 There was absolutely nothing we could complain about the Villa and its amenities in any way. Since we were celebrating my bachelors party at Pooja Kanda, we were having late night pool parties at the Villa. Special thanks to Sushant (Chef) and the house boys (Tharanga & Dickman) who put up with all our late night food requests. They made us feel at home with their everlasting smile and eagerness to make our stay comfortable. The food too was absolutely stunning (Sri Lankan Cuisine) with Sushant preparing Huge Spread's fit for the Royals! A HUGE Thanks to the Pooja Kanda Team for giving us a Memorable and Unforgettable Experience. P.S: We are already in the process of planning our next trip back to Pooja Kanda, hopefully by the year end. We enjoyed it to Pooja Kanda, everything was perfect. 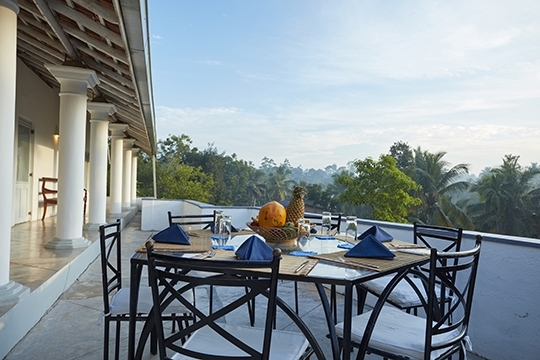 The splendid villa, delicious cuisine carefully prepared by the chef and his team. Loku, the supervisor has organized a party for a birthday party with dancers and musicians, fireworks, BBQ, ..... unforgettable. Everything was done for our comfort and we really enjoyed! Thank you to Rob, the manager and his team (supervisor, cooks, gardeners, cleaning lady, Guardians) .... it was a dream for us and you've done! At another time perhaps, but with the kids because I think it will be paradise for them too! Sylvie, Sophie, Joelle, JF, Benoit, Michel. We really enjoyed our stay in Pooja Kanda. Everything was first-class. We were warmly welcomed by all the staff on arrival and they looked after us superbly the whole time we were there. The pool is delightful and the monkeys put on a show for us in the front garden every morning and evening. Susanta, the chef, was brilliant and he served up beautiful Sri Lankan cuisine for us, with healthy child-friendly options for our three children. Dickman and Taranga were great fun and spent a lot of time with our youngest. The villa manager, Rob, and the villa supervisor, Loko, made sure we always had everyting we needed. 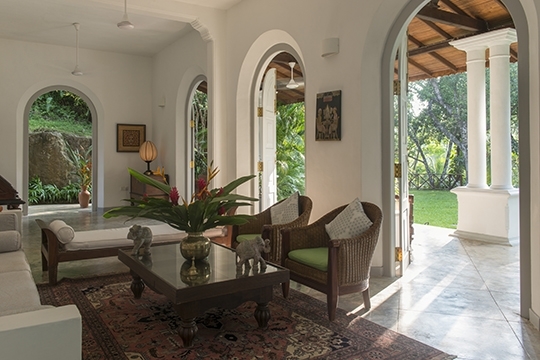 Without doubt, this was one of the best stays we have had in Sri Lanka. The property is beautiful, fantastic location, lovely pool hewn out of the rock, and the house is light and airy, with very comfortable bedrooms. Whilst the staff are friendly I'm afraid that they need a serious word in their ear about levels of service, which really let's the place down. The food was very average, in fact some of the party complained it was inedible. Pooja Kanda has so much potential, and we all had an amazing weekend there, but it was more to do with the location, ambiance and company than the service we received. 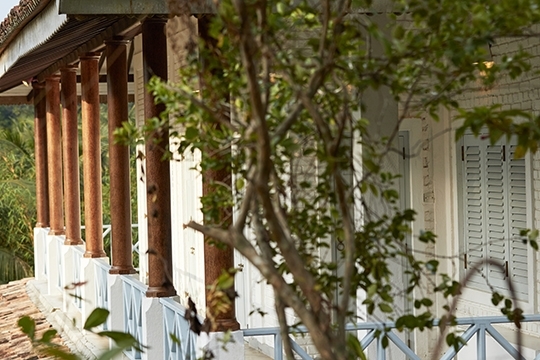 We found Pooja Kanda to be one of the most magical places we have ever been. From the minute we arrived in the early morning mist to the day we (almost tearfully) left, we couldn't believe how lucky we were to have discovered this place. 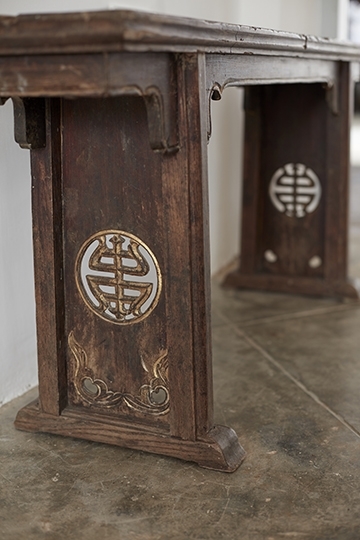 It has a charm and character that you will never find in a 5 star hotel, and you therefore feel as if you are experiencing something quite unique. 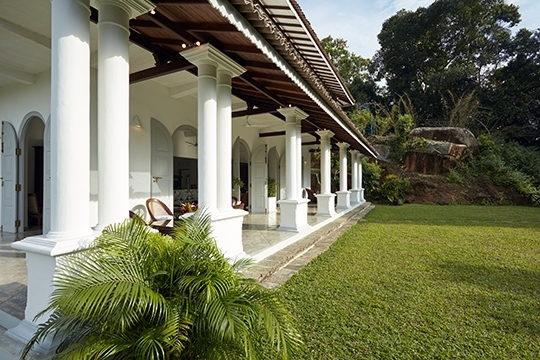 Although it is in the (vaguely) touristy South Coast of Sri Lanka it is located in a little real neighbourhood, and it seems as if it is the only foreign-owned house in the vicinity. So when we went walking around with our 3 sons, the people who live there were so friendly and gracious and seemed genuinely quite happy to come outside to wave to us or have a chat. The staff at the villa could not have been better. The cook was sublime, and the staff were so helpful and kind. My son celebrated his 6th birthday there and they rushed out and bought him a cake and decorated the room and provided a traditional Sri Lankan breakfast. Amazing. If you are looking for a modern, state of the art villa right on the beach this is not the place for you. But if you are looking for a quiet and peaceful snippet of real Sri Lankan life (Langur Monkeys in the garden and all) then this is the place for you. We really loved it. We had an excellent stay and thoroughly enjoyed our New Year visit with our family group. 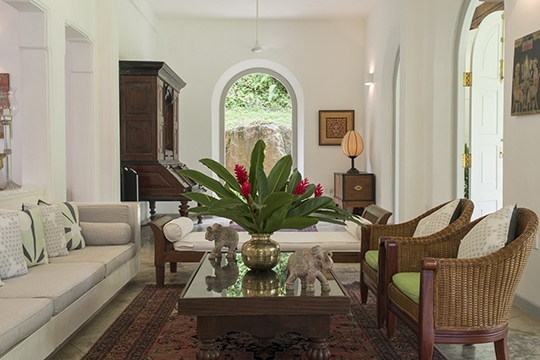 Pooja Kanda is a delightful villa, with an airy colonial feel. The layout is well-configured and there are plenty of areas both inside and on the various verandahs where you can just curl up with a book, magazine or ipod and relax. The size is perfect for an extended family or group of friends. 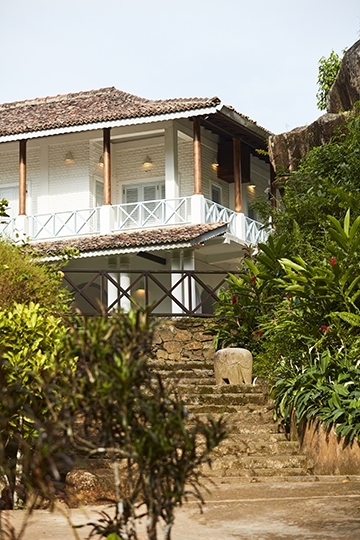 It is spacious and secluded in the middle of nature. A walk down the road to the village gives you a real sense of the local life in that area of Sri Lanka. The villa is very child-friendly with a gate around the pool and a stair-gate if required for toddlers and the TV room is great as little playroom. Internet access was a bit erratic. The food was fabulous! We ate local dishes all the time. Malika was a great cook and made us a delicious spread everyday. However each meal was a bit of a surprise as we were never quite sure what we were going to get. We would just ask for fish, or chicken or a particular vegetable and she would conconct something amazing! Wildlife abounds! There were all kinds of animals and insects to see which fascinated both children and adults. Monkeys, birds, caterpillars as well mosquitos (take lots of spray!) Bats! Scores of them in the trees next to the house at the top of the rise. For things to do the Handunugoda Tea Factory, which is fascinating, is probably 20-30 mins drive. Galle is probably 25 minutes depending on the traffic. There is a turtle hatchery at the end of the road in Habaraduwa about 5 mins drive. 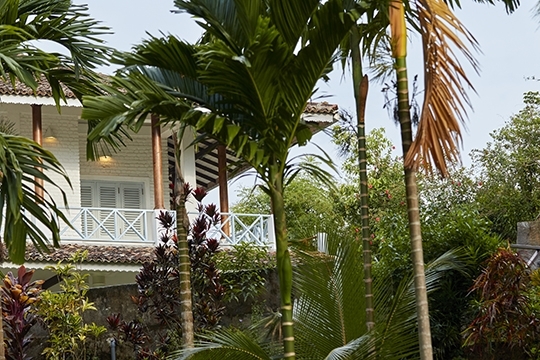 Koggala Lagoon and the Spice Garden are about 10 mins away. We found the most beautiful beach at Habaraduwa just next to the turtle hatchery with nobody on it. It was clean and stretched for 2-3 km with beautiful sand for the children to play. A bit rough for swimming though. The famous Unawatuna beach was more crowded and there was not much space as the tide was up. 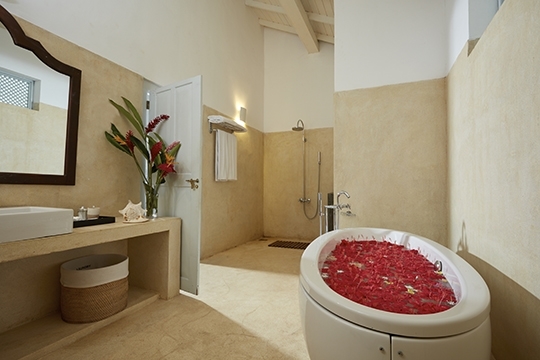 Overall we had an excellent stay and I would not hesitate to recommend this villa to anyone. Thank you very much! 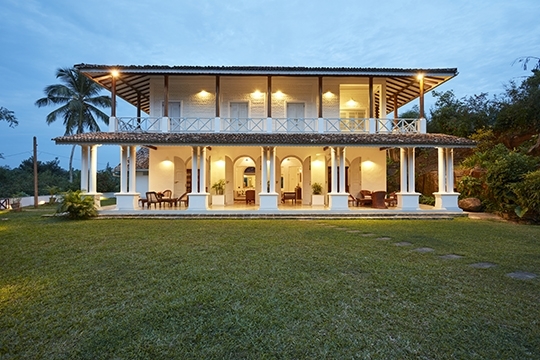 Villa Pooja Kanda is located a few kilometres inland from the busy market town of Habaraduwa whose extensive sandy beach extends eastwards towards Koggala. The villa sits at the top of small rise around the base of which is a scattering of village homes. Aged trees and tropical plants characterise the large garden and provide respite for the many birds and wildlife that come to visit. The nearest beach is at Habaraduwa, however for the best swimming and for a wider range of facilities Dalawella and Unawatuna on the main road towards Galle are much better, especially for families with children. 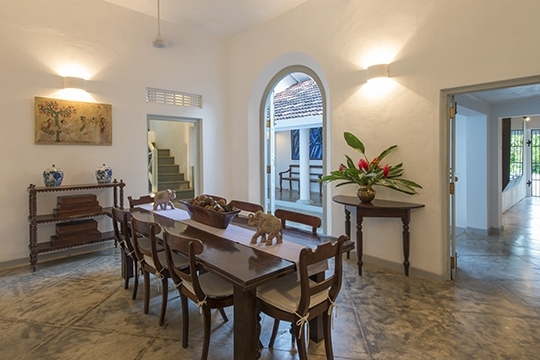 With a long stretch of golden beach, peaceful inland lagoon, fascinating folk museum and famous airfield, Habaraduwa-Koggala is a great little destination 12km south east of Galle. The golden sands of the three-kilometre beach stretch from Habaraduwa – famed for its turtle-hatchery – to beyond Koggala, a Free Trade Zone further east, where big hotels stand shoulder to shoulder along the sand. Habaraduwa’s palm-fringed beach is one of the widest and prettiest in the region, yet as you wander further east towards Koggala the beach narrows and it’s here you’ll see stilt fishermen at work. Inland is Koggala Lake, a meandering island-sprinkled lagoon which is a haven for wildlife lovers. Fishermen traverse the quiet depths leaving ripples in their wake as they hunt for fish, crabs and prawns. Spice islands and mystical temples also scatter the lake, and an early morning or evening punt atop the water in a traditional fishing catamaran is the best way to appreciate this quietly spoken scene. Madul Doova, one of the islands in the lake, was the subject of a book written by the late Martin Wickramasinghe, a lauded local author. 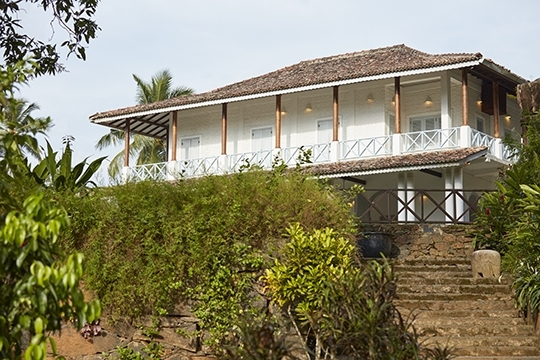 His home in Koggala is now a folk museum that charts the fascinating story of his life and times. Koggala Lake is also the landing strip for domestic Air Taxis, which reduce journey time to the south coast from Colombo's airport to just 40 minutes. Local restaurants centre on the beach hotels, and ATMs line the main road between Habaraduwa and Koggala. 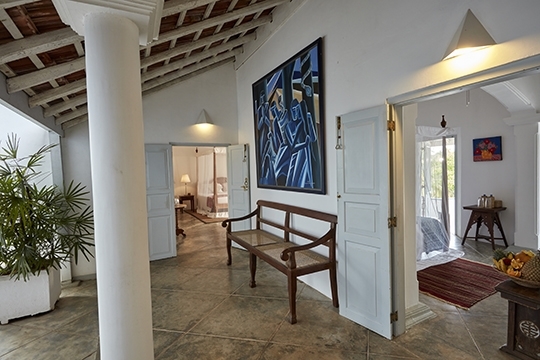 A winding driveway ascends the hill up to Villa Pooja Kanda, which stands at the summit. 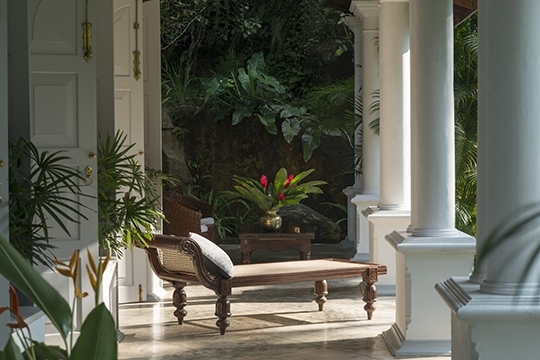 After crossing a sun-dappled lawn you enter the villa via a deep twin-pillared veranda furnished with antique rattan. 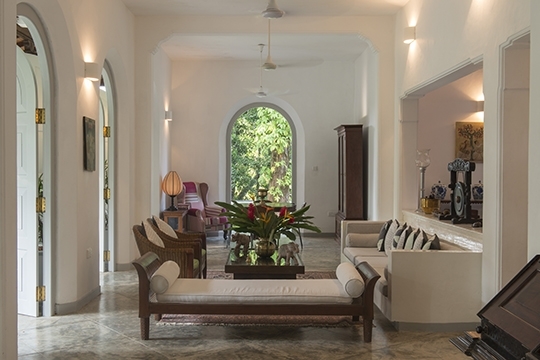 A set of four high arched doors lead into a spacious living room that stretches the width of the house. 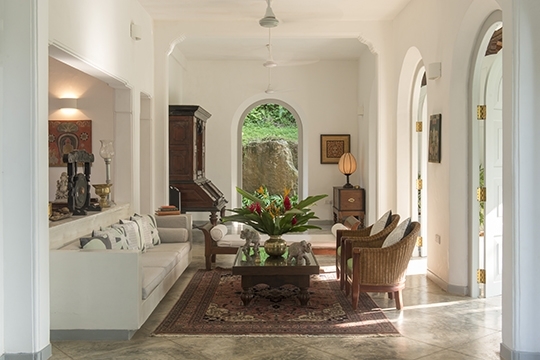 At either end of the living room are single arched doorways opening onto verandas that lead to the pool and connect with the back of the villa. To the rear of the living room, separated by a low half-wall, are a dining area with seating for ten and a small under-the-stairs hallway whose shelves burst with books. To the right of the dining area is an air-conditioned TV Room with built-in sofas, whilst to the rear is a guest washroom and a large equipped kitchen. 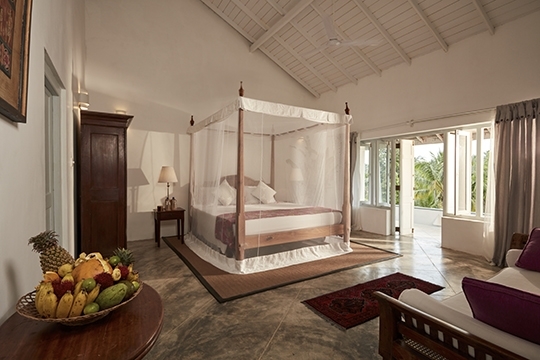 At the back of the house, beyond a small courtyard, are two interconnecting ground-floor bedrooms that function well as a family suite: to the left is the large master bedroom with king-size four-poster bed, writing desk, wardrobe, views of the garden and access onto a private veranda that connects to the pool terrace. 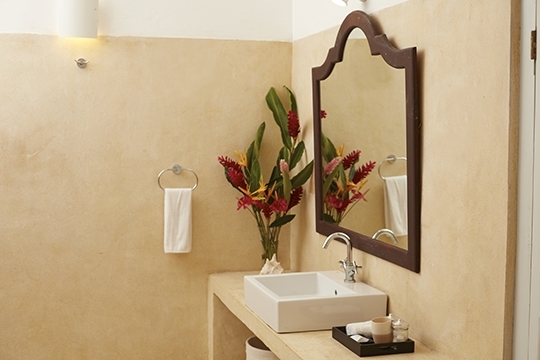 Its modern ensuite bathroom is equipped with a tub, a rain shower and a washbasin. 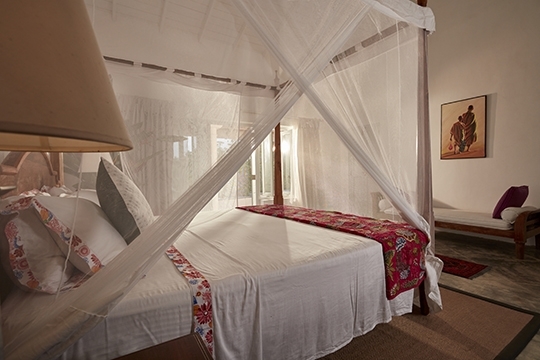 The second bedroom is smaller and furnished with a queen-size bed. 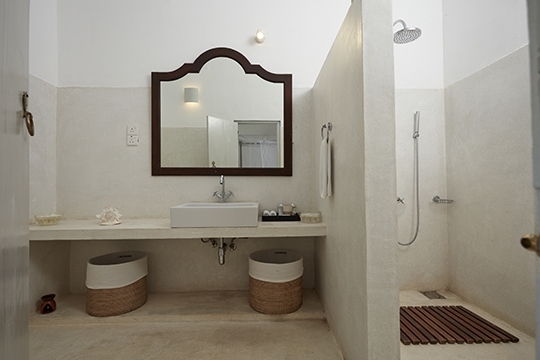 This room also has access to the veranda and is attached to a modern shower room finished in smooth polished cement. On the first floor are three similarly sized king-bedded rooms connected by a balcony that encircles this upper floor. 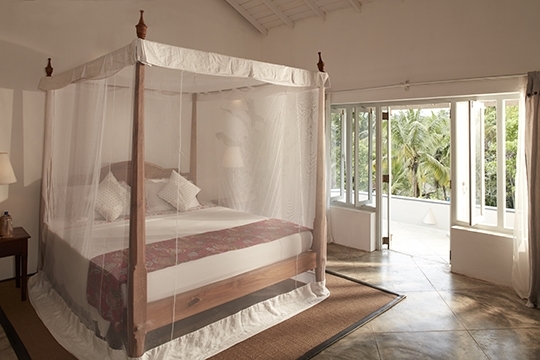 The first bedroom to be reached opens onto a private seating area from where you can watch passing monkeys and birds. 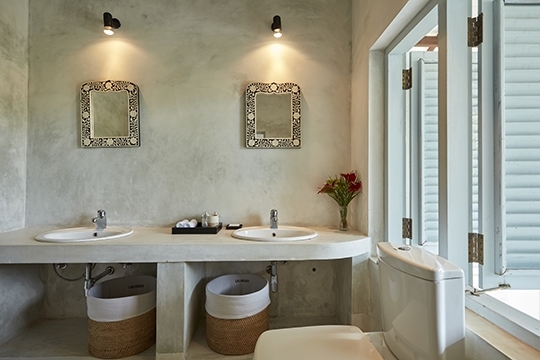 The ensuite bathroom has a shower and twin washbasins. The remaining two bedrooms are identical in size and design; one opening onto the front balcony and the other to the rear. 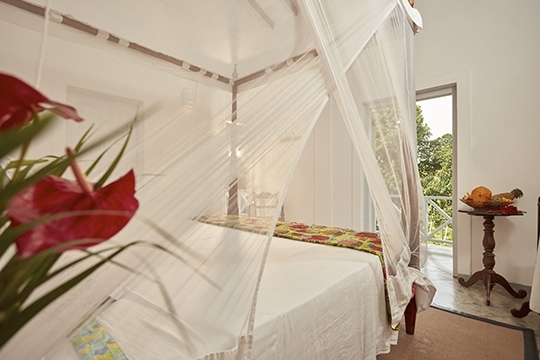 Both are furnished with four-poster beds and have small ensuite bathrooms with showers and twin sinks. All bedrooms are air-conditioned. 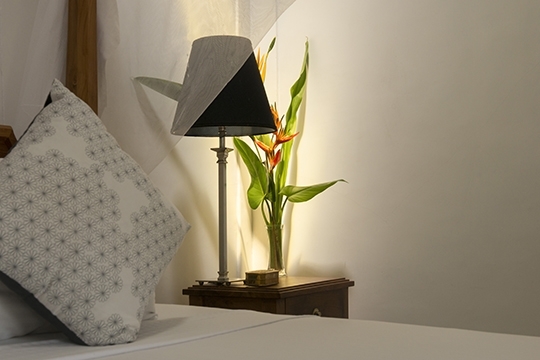 - Last minute bookings enjoy 15% discount when checking in before 18-May-2019. 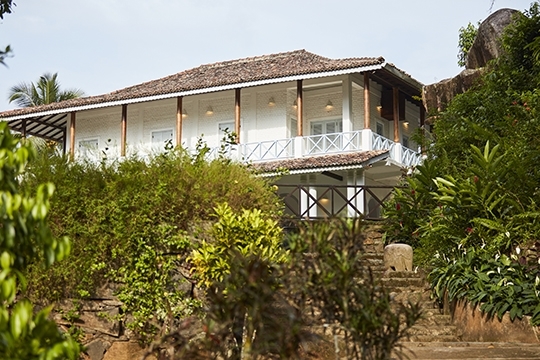 Discounts are sometimes available for booking last minute within 10 nights of arrival, or long stays with minimum of 14 nights (please note in cases where more than 1 discount is available, the higher discount shall apply for each booking ). For discounted rates click on the Check Availability button and enter your dates or contact Customer Service. 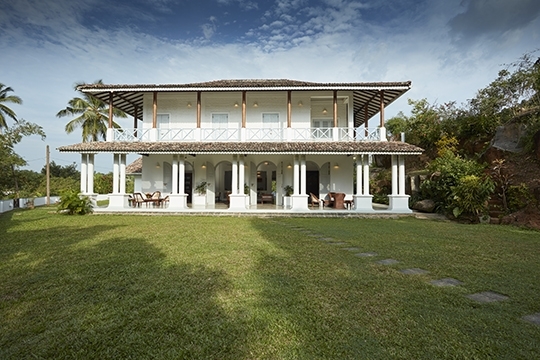 5 bedroom villa located in Habaraduwa-Koggala, South Coast. Ideal for Beach in ten, Bring the relatives, Kid friendly, Fair share for groups, Room with a view, Rural escape.